On Thursday, April 28, Chancellor Jerry Falwell, Jr. hosted an appreciation luncheon to honor Dr. Boyd Rist for his service to Liberty University as the Provost and Vice President for Academic Affairs. For the first time ever, the individuals who have provided the academic leadership for the past forty years were together. The first Vice President for Academic Affairs was Dr. J. Gordon Henry (fourth from left). The next chief academic officer was Dr. Russell Fitzgerald (second from left). Dr. Earl Mills (far left) played a significant role as the provost. 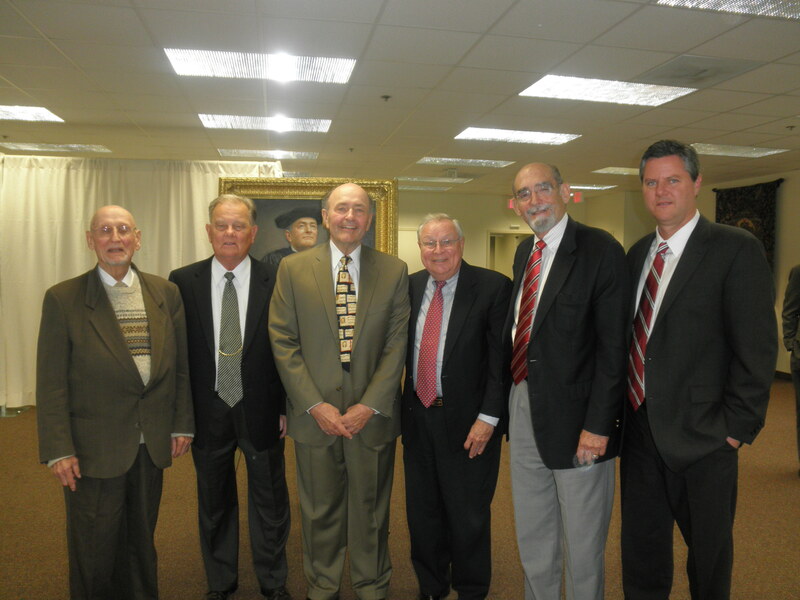 Dr. Boyd Rist (third from left) followed Dr. Mills. Dr. Ron Godwin (second from right) is the current Acting Provost and, in that position, has oversight of the academic program. Dr. Jerry Falwell, Jr. (far right) is the Chancellor of the University. Once again, Adam Nathanson (missionary to Venezuela and pastor Grace Community Church, Caracas) and I teamed up to teach and preach the things that pertain to the Lord Jesus Christ and His Kingdom across a major portion of Venezuela—moving from west to east with Caracas the starting and ending point. We worked in six states—an amazing opportunity, including Yaracuy State, the avowed center of idol-worship and witchcraft. Sadly, the president of the nation has been a leader in placing some of the idols and spiritism symbols on the currency. The spiritual war is on! The seminars were in three areas: four in Caracas (capital city with five million people), two in western Venezuela (San Felipe and Tumero, seven in eastern Venezuela (Boca de Urichae, Clarines, Cumana, Caripe, Anaco, and Barcelona). Each seminar was open to pastors in the respective areas and a large number participated. All 2,000 Spanish prayer seminar workbooks were used and we needed more. In each session, interest was intense and the response was strong. Well over two hundred trusted Christ as personal Savior following a thorough presentation of the plan of salvation in the seminars. Further, there were 200 saved in homes or on the streets when folks went out from the Caripe Baptist Retreat Center. In addition, hundreds indicated that they had made decisions about their spiritual lives. Miles traveled totaled 7,113 (Air—international and domestic 5,388, Ground 1,725). There were twenty-three days on the road. Each venue went as clock-work, not one problem! All in the unction of the Holy Spirit rested upon each seminar, each teaching opportunity, and the sermons. There is an invitation return in February 2012 to conduct prayer seminars in an area where Sue and I came in 1992. This is Pastor David Meza’s home area where churches are mushrooming with large numbers people coming to Christ. A second invitation has come from Pastor Antonio, the coordinator of the mountainside retreat center in Caripe, to return as keynote speaker in a major conference for pastors/leaders at the end of April—early May. Since it is obvious that the Holy Spirit is working and a spiritual awakening is underway in a strategic nation, how can I say no? I asked all our partners to begin to pray for these events scheduled for 2012. On behalf of each person touched, we express thanks to the Doorkeepers who provided funds for this work. The budget was met and exceeded significantly. “The Lord repay your work, and a full reward be given you by the Lord God of Israel, under whose wings you have come for refuge (Ruth 2:12). For over twenty-five years, our partners have sat down and written checks to enable us to go to other nations with the prayer seminar ministry. From the very first check to the very last one I am encouraged, but am humbled. Both Naomi and Ruth were encouraged by the kind acts of their Kinsman-Redeemer, Boaz. In their very first conversation, Boaz acknowledged Ruth’s faithful acts on behalf of Naomi, “you left your father and your mother and the land of your birth, and have come to a people whom you did not know.” Then he said memorable words, “The Lord repay your work, and a full reward be given you by the Lord God of Israel, under whose wings you have come for refuge” (Ruth 2:11b-12). To our prayer and financial partners, this is my daily prayer for you. Thank you for your partnership. May the Lord reward you fully. Venezuela Update. In my last letter, I reviewed how the Lord blessed our efforts in 2010 in western Venezuela. Hundreds received instruction in the prayer seminars. Hearts were prepared to evangelize four mountain states. 6,010 came to Christ. “Do it again, Lord” has been the thrust of our praying. The schedule was finalized as April 3-25, twenty-three days. Isaiah Rojas, leader in the National Convention of Baptists in Venezuela, and a missionary asked that we come to Yaracay in western Venezuela, the recognized center of idolatry worship and witchcraft for the nation. When the request came, I agreed, and added five days to the schedule. Our partners provided the needed funds for 2,000 Spanish prayer seminar workbooks and the expenses for Adam Nathanson and me to travel. You can follow the work day-by-day on the “My Blog” section of our website. This is the entry for Friday, April 8, which is Day 6. I was pleased with tonight, but it was difficult. We were in a large stadium-type building and the people were in the bleachers on one side. There were sixteen Baptist churches/pastors involved. The intention is to conduct these meetings quarterly. There was a little over an hour praise and worship. Many, many young people with blasting music with all the different instruments/drums were among the crowd. Adam translated the words they were singing and they were generally good. The missionary-coordinator indicated that the consensus of remarks was that deep conviction had fallen over many. How we will see what happens during the four hours today. After we finish, we drive four hours east toward Caracas and the Sunday prayer seminar. Yaracuy State is the center of witchcraft and open idolatry (worshiping statues are all around, including one for John the Baptist). The center of worship is a black lady on a horse, as I told you yesterday. There is a practice common of putting a curse on someone. I termed this spiritual darkness and shared about the Pakastani Lighthouses of Prayer. Five of the twelve prayer seminars will be completed by the end of the day. Attendance has been remarkable. Well over fifty have made professions of faith. Adam was receiving text messages all day yesterday from people who attended the Caracas seminars speaking how their lives have changed. Sam Olson, the pastor who has 6,000 attending and who is chairman of the evangelical council in Caracas with over one million members, prepared a DVD of the six-hour seminar in his church. We hope to make this available throughout Venezuela. Hugh Bryan would say "the wheels are turning" and I will say, "God is working. You won't believe this. Isaiah Rajas, the Baptist convention leader who is scheduled to drive us this afternoon, was on his way to San Felipe (around 700,000 and capital city of Yaracuy) and was robbed enroute with everything taken, including his cell phone. He hoped to be here by midnight. This is so difficult to believe since he is a seasoned traveler. Of course, we will learn more when we see him this morning. I feel so badly for him. Venezuela Update. In my last letter, I reviewed how the Lord blessed our efforts in 2010 in western Venezuela. Hundreds received instruction in the prayer seminars. Hearts were prepared to evangelize four mountain states. 6,010 came to Christ. “Do it again, Lord” has been the thrust of our praying. Please use the draft itinerary and provide prayer covering for each step. A missionary asked that we come to Yaracay in western Venezuela. When the request came, I agreed, and added five days to the schedule. April 3-24 are the new dates and the budget has been adjusted accordingly. The funds are being received daily. Thank you and may the Lord “repay your work.” Every time we receive 100 gifts, all needs are met. As I am writing, we are almost half-way to that goal. To those who have given, I am grateful. I have no doubt that others will seek the Lord’s will and be ONE OF 100. I will provide you with a full report in the May Reflector and on our website—www.jgordonhenryministries.org. Hopefully, I will be able to share often using the “My Blog” section of the website. A little help needed. Someone asked me during the recent prayer revival in Columbia, South Carolina, about my plans for the future. Obviously, he was thinking of my age. My response was that I hope to have ten more years (the Lord willing). That will bring me to 85. Then I hope to say, as did Caleb when he was 85, I want to be assigned a big task, even where the “giants” are prevailing. For 2011, I have many unscheduled Sundays. As I prayed about open doors, I was impressed to ask all of you to help. A few days ago, Maggie, our soon-to-be five years old great-granddaughter, said, “Granddaddy, will you do me a favor?” Of course, I said, “Yes!” Will you do me a favor? After praying for guidance, will you tell others (either far or near) about the availability of the prayer seminar ministry? I am including a brochure. Will you share it in your area? Remember, there is no charge for the prayer seminar ministry. Therefore, anyone can have a seminar in his area. A rule of thumb is if anyone will provide three possible dates, we usually can schedule one of them.As you provide this help, may a “full reward be given you” and may the Father be glorified. Venezuela. Due to the political climate, there are few nations where the Christians need to understand the purpose and power of prayer more than Venezuela. If you listened to their president address the United Nations, you know how serious the challenge is for Christians. The leaders of the Venezuela Baptist Convention understand this need. To celebrate their sixtieth anniversary, they decided to evangelize four mountain states (where spiritism and witchcraft abound) and asked for our help. Phase one was in March 2010 and involved bringing believers together in ten cities along a thousand mile arc in western Venezuela for prayer seminars. Hundreds attended. Phase two was to return in August to instruct five hundred pastors/leaders in the area of prayer and evangelism at the Baptist camp. Phase three was hundreds going into the four states for two weeks. The result was 6,010 coming to Christ. In every church, members memorized Psalm 126 and recited it in every service. As we return to replicate what we did in western Venezuela in eastern Venezuela, our prayer is simple: “Do it again, Lord!” Will you join us? The financial need. The $8,640 2010 budget (for Venezuela, Paraguay, Uruguay) was met when 120 gave $10,981 (enough to cover the August trip, as well). The 2011 budget is $5,304 (international travel, internal travel, food/lodging, 2,000 Spanish prayer seminar workbooks). The budget could be met if five gave $1,000 or fifty-three gave $100. But we know that many of you cannot do that, but you can do something. No gift is too small, none is too large. You will remember that my goal for the past few years is to have one hundred gifts for each trip. Why? Jesus pointed out that where your treasure is, your heart will be there also. When your heart is with us, you will want to provide the prayer support that is necessary. That makes a difference! One hundred gifts always have been enough to meet our need. WILL YOU BE ONE OF THE ONE-HUNDRED? Thanks. I am encouraged and humbled that you will let me go on your behalf. I will keep you informed and will provide a full report as to the results of our working together with God (1 Corinthians 3:9). Psalms 79:3 - "Their blood have they shed like water round about Jerusalem; and there was none to bury them."